Camping La Champagne offers you the option of renting a mobile home, in case putting up a tent is not really what you’re looking for. We have 2 mobile homes (type Neptunus 26/10) on our small campsite, both of which are beautifully set on the second level of the campsite, with old oak trees in the back providing shade and a stunning view on the lower field and the Dordogne in the front. Both mobile homes are equipped with a kitchen, bathroom, living room /dining room, 2 bedrooms (2 singles, 1 double), and terrace doors opening up onto the wooden terrace. On this terrace you’ll have a table, chairs, barbeque and drying rack for laundry. As the terrace and the view are pointed to the west, you’ll be enjoying a spectacular sunset sipping from your favourite drink right in your lazy chair..it doesn’t get much better than that. 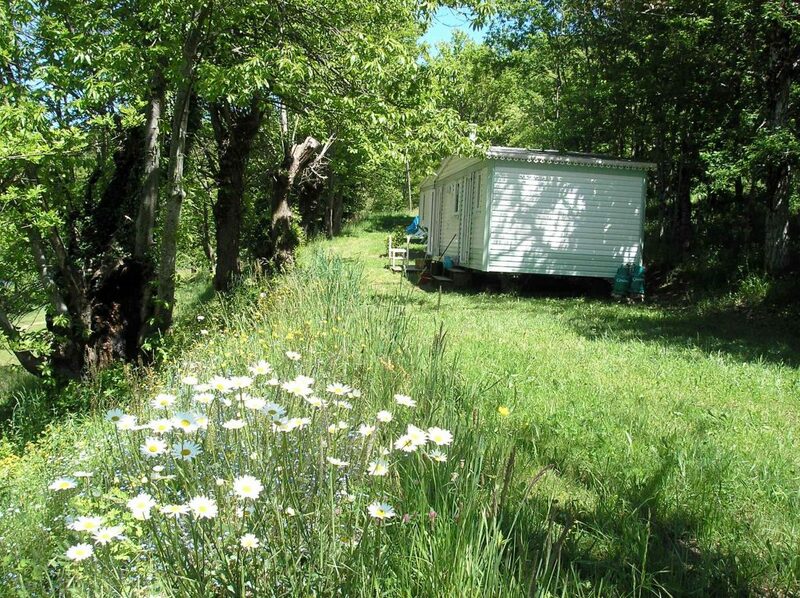 If you are interested in booking a mobile home on our small campsite on the Dordogne, you can directly do so on this website. Please click here to book your mobile home on our campsite. Please note: although the mobile homes are fully equipped, you will need to bring your own sheets and pillowcases.